Golf cars are available to rent on a daily basis, both by reservation and on a walk-in basis at the Atheneum Visitor’s Center. Our fleet of 8 golf cars can each accommodate 4 passengers. 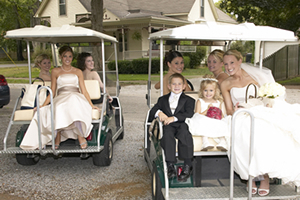 Our 6 passenger golf car will accommodate larger families and groups. All golf cars must be rented in accordance with the Town of New Harmony Golf Car Ordinance.